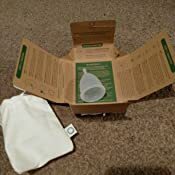 Amazon's Choice for "menstrual cup"
Sent from and sold by Blukoo. OrganiCup Women menstrual cup is eliminates irritation and dryness while ensuring the natural pH balance is kept intact. OrganiCup is made of 100 percent soft medical-grade silicone that doesn't mess with your body. It is bleach-free, gluten-free, chlorine-free, perfume-free. 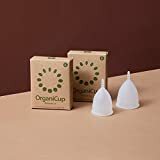 OrganiCup is reusable and should be emptied, normally twice a day. It is secured in position by a light vacuum and the soft material won't make you feel a thing. Size A is for women who haven't given birth vaginally. 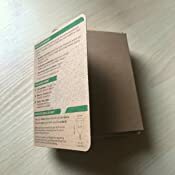 The EU Falsified Medicinal Products Directive 2011/62/EU requires all pharmacies and other businesses selling medicinal products to the public online, to register in a national list of registered sellers, and to display a common (European) logo on the websites offering their medicinal products for sale. 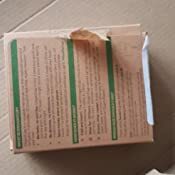 By clicking on the logo you can confirm if this seller is listed in the register of online medicine retailers maintained in EU Member State where the seller’s business is established. 5.0 out of 5 starsWhere has this been all my adult life? I was scared to use this at first but my goodness, this is by far the best product I've purchased within the last few years. I'm 29 and haven't had children so I have the smaller size. I can't stress how easy and carefree my period has been since discovering the Organicup! No accidents, no discomfort, no worries about unpleasant smells - I love it. Used to dread getting my period but not anymore, all thanks to this product. The fact that it's environment-friendly is a big plus and also that it's not harmful for my body is really the main reason I chose this product. Also, I thought it would be hard to insert it but most days I do it within seconds and when I'm struggling to insert it I just remove it and try again and it works. The fact that I don't need to empty it until I get home and even then it's still not full -- LOVE. 5.0 out of 5 starsNever looking back! It’s perfect. I was very nervous but really hate the waste of other products so decided to buy. First day I had a mini panic of not getting it out. But stay calm and it is actually is super easy once you relax and get the hang of it. Had it three cycles and it is absolutely perfect. No worries of leaks, can keep it in all day so no worries about bathroom visits. I also seem to have far less pain! I wish I’d used it sooner! Would recommend to everybody. 5.0 out of 5 starsRead all the online tips before using! 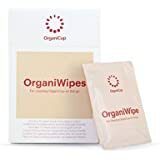 I did find the organicup difficult to use at first, especially putting it in. However I watched the video stuff on the organicup website which was helpful, and I read through other tips online. Now I’ve relaxed a bit and feel more confident with it im so glad I made the switch! Inserting and removing it gets easier each time I do it. I only ever empty it once at night and once in the morning, it is never even nearly full (I have a light/medium flow), and so liberating not to worry about taking tampons/pads everywhere in my bag and changing them in public toilets throughout the day. Sleeping is fine with it, and it’s never leaked at all. I like that the cleaning is pretty simple, boiling for 5 minutes at the end of each period is not much hassle at all. Here’s to never paying tampon tax again!! 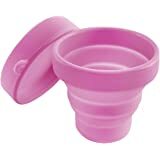 I had vaguely heard of menstrual cups but I didn't really know much about them. After some research I settled on this one because it had good reviews. After using it for my first cycle, I am totally converted and don't know why this invention isn't shouted from the rooftops. Totally leak free, very comfortable (admittedly, once you get used to it after the first 3-5 attempts) and sustainable. 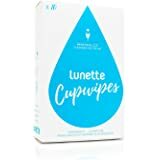 I always had issues with tampons feeling very dry and painful with the added con of it then still leaking and this has resolved all those issues. Will never look back! I bought this as a birthday gift for my friend (I know we're great gift givers haha), she loves it, she was worried about toxic shock syndrome when using tampons and pads, and now she doesn't have to worry about that and she doesn't have to pay for sanitary products for the next 10 years. I bought the organicup after reading reviews and watchig ‘precious stars pads’ review on this cup. Wearing tampons have always made me sick and I hate the feeling but after watching the tutorial videos on this page and on YouTube I have it a go and OMG!! It is the best thing ever! I don’t feel it on, is painless, no smells, I feel clean and overall I feel like I don’t even have a period at all. The application is quite easy, I used the C fold method but overall,relaxing is key. The removal process is easy, I use my pelvic muscles to push it down a bit and voila. I have a high cervix so I didn’t need to cut the stem but I don’t feel it at all. I love this cup, it is my very first one and I cannot complain, I love it!! 5.0 out of 5 starsGame changer!! I was slightly apprehensive about this as I’ve been a tampon user forever but I used it yesterday and today and it’s a total life-changer! 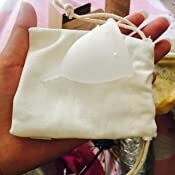 No more tampons, no more overflowing, no more string in the wrong place and no more carrying keeping tampons stashed in various places. First time was a bit awkward but got the hang of it on the second time, was worried about having difficulty removing it but that was also super easy. Can’t believe it took me so long to start using this - very highly recommended! !